Martyman declares victory! Things got a bit messy, but he successfully baked his first loaf of banana bread. It was touch and go there for a while—especially after he forgot to add the eggs. If you missed my initial post on this, Martyman had to pull the hot pan out of the oven, pour the dough back in the bowl, and remix with the eggs he had forgotten about. But maybe he’s onto something. The bread turned out delicious and extra tender. Now I’ve got to stop him from eating too much and getting sick. 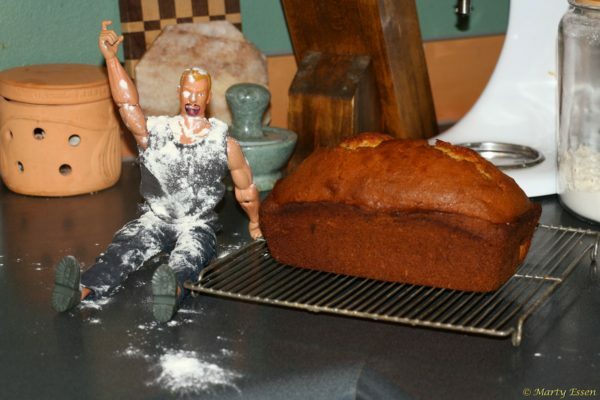 It’s amazing how many pieces of banana bread an action figure can fit into that little hollow body.